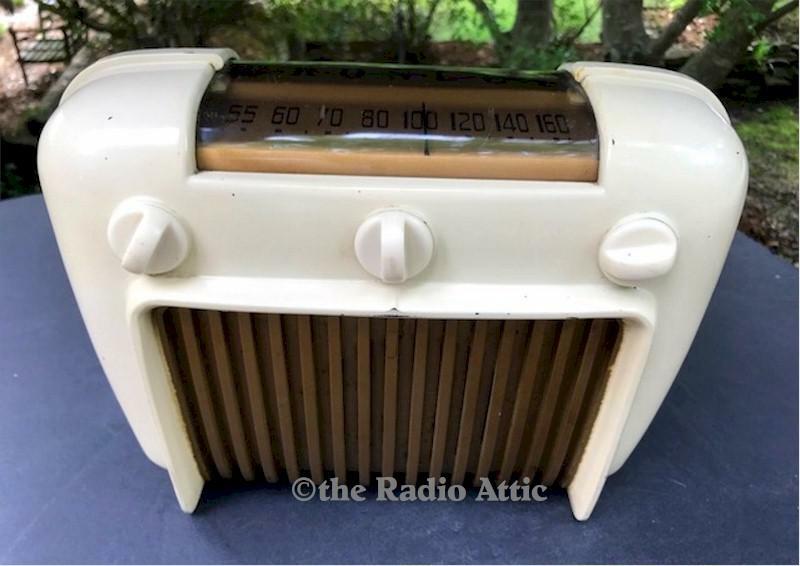 Crosley "Duette" from 1947 in its original ivory paint. A one-of-a-kind very unusual styled case. Nicknamed the "Duette" due to its symmetrical back and front. A 1947 Crosley magazine advertisement for this set said it was "Smart and new from every view." Crosley must have employed a poet! This case is in nice condition, just a few small paint chips, but no other major issues like cracks. The radio has been recapped and gone over by a pro, and it plays well, picking up all my local AM stations with no interference or filter hum. There are three knobs, one on/off/volume, one for tuning, and one for tone. The dial lamp is working. About 11"W x 8-1/2"H x 5"D.
You are visitor number 710 to this page.